"Harvey, I've met this Indian...."
Nothing has been the same for me since those simple words were spoken. My life's real work had abruptly and inexorably begun, and I was merely annoyed. Looking back now, nearly two decades later, I try to reconstruct how it all began, how it came about that we -- two unlikely white journalists -- became runners stumbling between two worlds, spirit-journeyers on the path of the Wisdomkeepers. Events that seemed isolated and utterly unconnected at the time I now see as parts of an emerging whole. What's more, the whole itself keeps changing, as do we. The ever-shifting parts dissolve and reform, metamorphosing in and out of each other as in a dream. The pieces of memory come floating back at me. There was Steve Wall, who got me into all of this, and there was Two Trees, who envisioned this spirit-journey in the first place and who remains a dark and unsettling enigma to this day. There was the Maestro's mystic condor in Peru, and there was Frank Fools Crow's miraculous eagle at Wounded Knee. There was Leon Shenandoah, who taught us there was a path, and Mathew King, who taught us there was a set of instructions for following that path. "Original Instructions for being human," he called them. There was the eagle's feather and the owl's claw -- the signs that Two Trees predicted we would receive and which assumed a special metaphoric power for us as they propelled us onto the path. And then there was me, yanked out of the ordinary and flung into it all despite myself, protesting and complaining all the way. I remember that pale gray morning in late November 1981. A light snow was falling at an angle past my seventh-floor window at National Geographic Society headquarters in Washington, D.C. I was at my desk writing an article for the magazine about the return of the Sinai Peninsula from the Israelis to the Egyptians ("Eternal Sinai," April 1982). Just six weeks earlier I had stood some twenty-five yards from Anwar Sadat at the moment of his assassination during a military parade in a sports stadium outside Cairo -- not quite the usual stuff for a National Geographic staff writer and, since my article wouldn't be published for many months, hardly a major news scoop. But I was properly shaken by the incident, seeing some special if indefinable personal providence at having been present at that vortex of history. I remember, moments after the first shooting began, standing there poised on the stadium tarmac, frozen more in amazement than fear, caught with arms akimbo in the crossfire between Sadat's fleeing assassins and the security police, bodies falling all around me. As I stood there a young dark-skinned Egyptian man in army fatigues, probably no more than seventeen or eighteen, ran wildly past me, his doelike eyes wide with fright; he was followed by half a dozen screaming security police in their blue uniforms and white helmets. Perhaps thirty seconds later they carried him back past me like a sack of potatoes, pummeling his limp form with fists and truncheons. I managed a few frames with my camera before being pushed into a crowd of journalists by police. "No pictures! No pictures!" they screamed. I remember most vividly the tumbled wooden chairs, thousands of them, which had been flung aside by the terrified crowd as it tried to escape the shooting, and the astonishing redness of the blood spreading out from under the bodies strewn around me on the tarmac. I distinctly recall asking myself, "What in God's name am I doing here?" and, all the while, thinking of my wife, Lorraine, and our children back in Washington. Though she hadn't told me for fear of upsetting me, weeks before Lorraine had had a kind of dream or presentiment about my being surrounded by blood. She follows the way of Subud, based on the Latihan, a spiritual exercise of surrender to God, and for weeks before Sadat's assassination she had the inward experience of there being a shooting, with blood everywhere and me in the midst of it. When she'd received that blood vision repeatedly during her Latihan, she feared the worst but knew I couldn't opt out of a major magazine assignment on the basis of a dream or presentiment; nor would I have. She even secretly packed a bag so that she would be ready to fly out to Egypt in an emergency. When she watched TV that day, October 6, 1981, and heard the first news of Sadat's assassination -- she knew I'd be seeing him that day -- she was actually relieved; she instantly realized it was Sadat's blood she had seen in her Latihan, not mine. I don't know why she didn't think it was my blood, too, which it might well have been, but she simply knew it wasn't, she said -- which I confirmed to her by phone from Egypt a few hours later. Now, months later, back out of the vortex of history and safely ensconced in the secure confines of my office, I was trying to reduce the complex elements of that event to a few paragraphs of crisp, factual, unemotional copy for the magazine when the telephone rang and my new life began. The voice on the phone was Steve Wall's. He was calling from the Appalachian wilds of northeast Georgia, where he was at work on a freelance contract for the magazine photographing a story ("Wild Water, Proud People," April 1983) on the Chattooga River, the wild-watered river of the movie Deliverance. Steve and I had worked together briefly a couple of years earlier on an article about Vietnamese boat people who had migrated to the Gulf Coast. He had a pleasantly blasphemous manner about him and was one hell of a photographer. He also had a way with ideas and a mulishly stubborn habit of seeing them through to the end, come what may. The article on Vietnamese boat people had been his idea; he'd been given a speculative go-ahead or "flyer" by the magazine, then found that the elusive refugees he'd hoped to photograph at Empire, Louisiana, had fled white persecution to Biloxi, Mississippi. For weeks he hung out on the Biloxi fishing docks, where the Vietnamese fishermen congregated, getting to know them, winning their friendship and trust, and sending back to Geographic a trove of remarkable photographs -- rich, warm, intensely personal, and human -- that demanded publication. I was assigned the writing end of the article, which appeared in the September 1981 issue as "Troubled Odyssey of Vietnamese Fishermen." Steve and I had gone our separate ways on different assignments after that but had taken something of a liking to each other and had spoken of getting another magazine assignment together if the opportunity arose. His voice on the phone was, as usual, excited. Steve doesn't chitchat. He expounds. He discourses. He overflows with passions and wild enthusiasms. In that mellifluous North Carolina accent of his -- "You're the one with the accent!" he has told me many a time -- he announced, "Harvey, I've met this Indian." I could hardly have been more dismissive. "Really?" I asked him. "You've met an Indian? So...?" 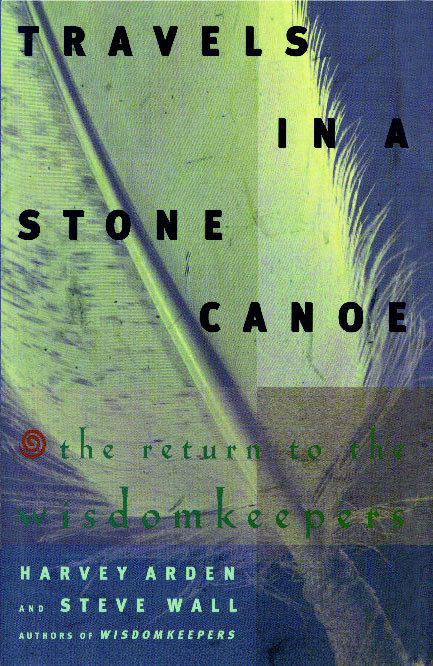 Steve continued, unruffled at my tone: "He's a medicine man, a Cherokee named Two Trees. An incredible character. Told me he knew I was coming to see him before I got here. Said he'd been expecting me." "Now listen to this, Harvey. There's something very special about this guy. He has this idea. I think it'd make a terrific story for Geographic. He says he's had a vision about a journey to what he calls the Grandfathers -- the greatest medicine men and spiritual leaders of the seven great Indian nations. He says it's a kind of mission, a journey of penance. He calls it a 'spirit-journey.' He wants us to go with him -- "
"Yeah...you and me! You didn't think I'd forget you, did you, partner?" Steve went on: "He wants me to go with him and photograph the whole thing. He says he's no writer any more than he's a photographer. I told him about you, how we worked together on the Vietnamese boat people article. 'That's the one!' he said. 'He'll be the writer, this Harvey guy!' He wants you to go along and handle the word side, write it all up just as it happens and also record the Grandfathers' words. So...what do you say? Want to go on a spirit-journey? Think the magazine would be interested?" "Now, Steve, hold on a minute." Deaf to my protestations, Steve rolled on with unchecked enthusiasm. "Now just keep listening, you hear? This is important. He says the Grandfathers are dying out and that the old ways, the old wisdom, is dying out with them. He says someone has to go out to them, take their photographs, record their words. He says you and I are the ones chosen to go out and do it. He says we'll receive signs when it's time to start." "He says we'll know when we get them." It all seemed a bit too much to swallow as I sat there in the marbled confines of National Geographic headquarters with blood visions of Sadat dancing in my head. Over the years, in the course of my travels for the magazine, I'd had a few troubling experiences with Indians. Once, in 1970, I was escorted at shotgun-point off the Crow reservation in Montana. I was working at the time on an article about the Big Horn Mountains and Basin -- never published -- and had been exploring a beautiful wilderness area called Black Canyon, deep within the reservation, when I stumbled on a summer encampment of Crow Indian teenagers at the canyon's bottom. After parking my shiny rented car and walking up to a group of Indians standing near the roughtimbered camp gate, I smiled, extended my hand, and announced my usual "Hi! I'm Harvey Arden, National Geographic..." A pretty picture of self-importance I must have made. A young Indian man cradling a shotgun walked toward me, grim-faced. He stopped a foot short of my nose, staring me down hard. "Ain't suppose t'be here, mister. Better leave." "Uhhh..." I stammered, taken by surprise, "the...uh...the Tribal Council chairman...Edison Real Bird up at Crow Agency?...He told me I could drive around the rez -- Doing a story for the magazine." I put on my most authoritative and confident smile. The young Indian man sniffed at me. "He ain't got no authority down here, that Edison Real Bird. And neither do you, Mr. National Geographic. You're trespassing on foreign soil, mister. This ain't your U.S.A. down here. This is Crow land. Indian Country. Better leave, you hear?" "Better leave," he reiterated, suggestively jiggling the cradled shotgun in his arms and toying with the trigger. There was no room for argument in his voice, and that look in his eye was not brotherly love. I left. It would be my first -- though by no means my last -- experience with the almost inescapable schisms between various "progressive" and "traditional" factions on most Indian reservations. I may have had Tribal Chairman Edison Real Bird's permission to explore the rez, but nobody else's. I was learning that when a white person makes a friend on an Indian reservation, he or she is also likely to be making, quite unwittingly, half a dozen enemies. This I could see was no easy world for an outsider to enter. You are seen through by every pair of eyes, friendly or otherwise. You are indeed an intruder. This is foreign soil! What other purpose could you possibly have for being here than some kind of exploitation or other? Frankly, I felt no strong personal pull to explore that problematical world despite my alerted journalistic instincts. Indians, after all, do "make a good story." They've always been as much a staple of National Geographic as of the silver screen. But the thought of walking up cold to an Indian reservation and finding my way back to the living, beating heart behind it all -- although alluring in its way -- was, to be blunt, uninviting. Hell, I could be going on a magazine assignment anywhere in the world -- Bali, Paris, Timbuktu. If I wanted to report on human suffering, why not get an assignment in Calcutta? The Indian reservations I had glimpsed now and again from the road during my travels seemed, well, dismal, unpleasant, distant from my usual world, seemingly in another dimension of time and space altogether. I'd driven past or through some of the Navajo and Pueblo reservations in the Southwest and had seen the slouch-roofed hovels in the distance, the forlorn figures weaving barefooted by the side of the highway, the roadside signs announcing CAUTION -- DANGER: ESCAPEES MAY POSE AS HITCHHIKERS. No, not a place a lone white man -- or two white men, for that matter -- would want to dawdle around, nosing into people's business, looking for a "good story." I didn't make the connection at the time, but only recently I had had another somewhat unnerving "Indian experience." That had been in Iquitos, in the Amazonian jungle east of the Andes, where, as part of my coverage for a Geographic article on Peru just eight months before ("The Two Souls of Peru," March 1982), I had witnessed an all-night curing rite by an Indian curandero, or folk healer, using the hallucinogenic native drug ayahuasca. I'd actually been looking for a brujo, a sorcerer or witch doctor -- standard Geographic curiosities -- but had been told by the locals that there were no brujos around there anymore, only curanderos. The curanderos, I was told, cured the spells cast by the brujos. When I asked how they could cure the brujos' spells if there were no brujos anymore, I received only a blank stare and a nonresponsive shake of the head from my uneasy informants. It was the kind of dumb question only a gringo journalist could ask. In any case, my guide, fellow gringo Tony Luscombe, finally found the name of a curandero who worked at the local slaughterhouse. "Just ask for the Maestro," he was told. I remember that, just as we walked up to the place, a young bull had broken through the slaughterhouse doorway as if out of a rodeo chute and was racing and bucking madly through the streets, snorting and bellowing, followed closely by a screaming crowd of men, women, and children brandishing sticks and flinging stones. They chased after the terrified beast, striking him repeatedly, until he finally veered wildly back through the doorway into the slaughterhouse, where the infuriated workmen he'd escaped from immediately and unceremoniously bludgeoned him to death with huge clubs to the joyous cheers of the crowd. The women quickly rushed up with their slop buckets to get some of the still-steaming blood and guts from this spirited beast. One old woman dipped her hand in the red gore and put it to her lips. "Para la fuerza!" she said with an ecstatic smile and a wild roll of her eyes. "For strength!" When I asked for the Maestro, I was directed to a small secondfloor apartment in a building just down the street. There I met Maestro Cristóbal, a wiry, angular, rheumy-eyed elder of Quechuan, or Inca, ancestry, who sat crosslegged on a low sofa with a tray of stained old colored bottles in his lap. He'd apparently been examining them when I came in. They looked like something Macbeth's witches might have filled from their bubbling broth of evil. The Maestro snorted when I asked if he was a curandero. He held up a small grimy corked bottle filled with a nasty-looking reddish brown liquid. "This is my power," he told me, using the same word -- fuerza -- as the old woman in the slaughterhouse had used for "strength." He pointed a finger at his right eye; the pupil seemed misshapen, a discolored yellow, like a broken egg yolk. He explained: "As a young man one day I had a terrible pain in this eye. It went blind. I went to the doctors, but they couldn't help. Then I went to a curandero. He told me a brujo had cast a spell on me, and at a ceremony he gave me the holy ayahuasca. It comes from the bark of a jungle vine. He prayed over me. He massaged my eye. The pain went away, but the eye was still blind. He told me that the brujo who had made the spell had too much fuerza, too much power. He, that curandero, could only cure the pain, not the blindness. For months I studied with him, and I became a curandero myself. All my life I have looked for the power to break the spell of that brujo and cure the blindness." He shook his head. "I am sorry to say that I have failed. I cannot cure the blindness itself or other maladies. My fuerza only makes the pain go away. You come to me because you have a pain, señor?" He looked at me hopefully. I explained to him that I'd like to witness one of his curing ceremonies and write about it in the magazine I worked for. He'd never heard of National Geographic but nodded at my proposal. The next night, in an abandoned thatch-roofed tanning factory on the outskirts of Iquitos, I watched for hours as the old curandero, amidst great ceremony and communal drinking of the bubbly red ayahuasca, sucked the sickness out of his patients' bodies with a "sucking stone." Leaning over their prostrate forms and setting the egg-shaped stone over their stomach or other afflicted body part, he sucked mightily at one end of the stone, every so often jerking his mouth away and, with a look of great distaste, spitting out some dark loathsome-looking liquid. Without exception his patients arose claiming to feel restored and without pain. I was, frankly, unimpressed. I saw what had happened as a kind of quackery, perhaps benign but quackery nonetheless. The sucking stone and the fluid, I had not the slightest doubt, were phony props. If those patients felt better after this treatment, it was simply the power of suggestion enhanced by the power of the hallucinogenic ayahuasca. I wasn't buying their metaphor, and hence it all lacked essential meaning for me except as a quaint ceremony -- just as a mass or a bar mitzvah or a sun dance may lack essential meaning and seem quaint to the unknowing and uncaring outsider. To the nonbeliever, which we all are when it comes to systems we don't "believe" in, the belief systems of others tend to be quaint, bizarre, even silly. The more we're stuck on the truth of our own metaphors, the more the metaphors of others seem false. And yet those patients of the Maestro's that night did go away feeling vastly better, I couldn't deny that. Every one of them insisted that his pain was gone or at least lessened. All would come back for further treatments. If this was quackery, it was apparently successful quackery. Does it matter how we're healed as long as we're healed? At one point late in the night, having completed the curing ceremony and put away his bottles of ayahuasca, the old curandero stood up and walked away from his patients, strode to the edge of the jungle clearing outside the factory, lifted his arms to the starless night sky, and started singing in low and guttural but strangely beautiful tones. "O Condorcito...Condorcito..." he sang, his eerie voice rising into the darkly overhanging jungle canopy. He cupped one hand to his ear, listened intently, then sang out again, "O Condorcito...Condorcito..."
Again he cupped his ear, as if straining to hear something out there in the murmuring darkness. Then suddenly he said, "Listen! Listen! Do you hear?" And I swear I did hear something out there, unmistakable and absolutely real, the loud whir and thunderous beating of huge wings. It was coming out of the impenetrable darkness directly above our heads, seemingly hovering above us. "There!" the Maestro said triumphantly. "Sometimes when we call him, the condor's spirit comes! And sometimes...sometimes when we call him the real condor comes! He's a messenger from Pachac Mama -- our Mother the Earth. Listen!" Again, as loud as someone beating a rug, came that beating of invisible wings in the darkness just above our heads. A vague chill slithered up and down my spine. Disbeliever though I was, I felt something palpable out there, something physical. I had declined to take any of the ayahuasca -- that at least might have explained such a reaction. My own overwrought imagination was the only explanation, I figured, or perhaps a mild hypnotic episode somehow triggered by the Maestro's power of suggestion. Nonetheless, the sound of those invisible beating wings had been disturbingly real. I think if that bird had actually materialized there before us at that moment, I might actually have become a believer. But the beating of the wings stopped as suddenly as it had begun, as if a switch had been turned off, and the presence above us -- or was it within us? -- abruptly disappeared. The Maestro smiled at me. "So...now you have met her. She smiles on you. She doesn't come for everyone. You can always call on her now when you need her. Pachac Mama...just call Pachac Mama, and she'll come to you." The Maestro went on, casually explaining to me how the condor in Inca lore symbolizes the Indian, just as the bull symbolizes the white man. He spoke of the old ritual, now banned but still secretly practiced in remote Andean villages, of tethering a condor to the back of a bull and letting the two of them fight it out to the death. More often than not the condor -- with its ten-foot wingspread and axe-sharp beak -- would finally triumph, giving the Indian a much-deserved metaphorical revenge over his white oppressor. But that sound of wings in the darkness when the Maestro had called out "O Condorcito..." had definitely not been metaphorical. I somehow sensed, despite myself, at least the possibility of something out there beyond the ordinary -- yes, even, let me dare say it, the miraculous -- but I didn't particularly think of it as an "Indian experience." It was simply a personal experience that happened to take place in an Indian context. No, I didn't believe in that mystic condor as the Maestro did. But ever since that incident I have sensed an inner connection in some inexplicable and intensely personal way with that condor and with Pachac Mama, as if something long closed had reopened within me at that unexpected moment. Some inward nonthinking part of myself accepted the condor as meaningful, even if it had been wholly imagined, and in accepting the emotional reality of that meaning -- indeed, taking what I can only describe as a kind of spiritual comfort in it -- I had somehow cracked the eggshell of disbelief that had hitherto safeguarded me, the objective journalist, from those nonobjective experiences that lay at the core, the inner quick, of indigenous thinking and belief. What before would have seemed to me merely quaint folkloric belief suddenly rang with an unnerving inner truth. I could not have defined it; I could only feel it. Oddly, looking back on it now in light of the way my life was suddenly being propelled despite myself in some new direction, my guide in Peru, Tony Luscombe, had repeatedly mentioned to me his experiences with a great North American medicine man named Frank Fools Crow. "He's much more powerful than the Maestro. You really ought to go out to South Dakota and meet him sometime," Tony told me. "Old Frank Fools Crow can do real miracles. Just go out to Pine Ridge and ask for him." I could not have dreamt that two years later I would be doing just that and that I would witness that same Frank Fools Crow pray an eagle out of the empty South Dakota sky at Wounded Knee -- a luminous moment when it finally came home to me that miracles and signs aren't merely possible, they're a natural and essential part of everyday life. hardly worth mentioning and, if at all, only with an embarrassed smile. How could I tell my colleagues that since that incident I "sensed" something I hadn't sensed before -- an "inexplicable meaning," or at least the possibility of such a meaning? They'd have scoffed and shaken their heads in amusement, as I suppose I'd have done myself if they'd told me of such an incident. And so when Steve Wall announced to me on the telephone that he'd met this Indian medicine man named Two Trees who had predicted that the two of us would receive signs when we were to begin our spirit-journey, I winced inwardly. This matter of Indians frankly made me uneasy. I had grown up in Chicago. To me, Indians were those costumed figures in warbonnets I saw in dusty glass cases on school trips to the Field Natural History Museum. They came to life, these wondrously befeathered people, only in the movies and seemed somehow always to be futilely riding around the circled wagon trains of the U.S. Cavalry, intent on mayhem. Sometime in the vague past, I knew, they'd actually lived hereabouts and given us all those wonderful multisyllabic place names: Chi-ca-go ("place of the wild onions"), Mis-sis-sip-pi, Mich-i-gan, even Indiana! Then they'd gone off, apparently out West somewhere, to fade conveniently into history after doing in Custer at the Little Big Horn -- their final shining moment. To be sure it was an absurdly overdrawn and stereotypical view, but in the popular mind Indians somehow had always seemed to be overdrawn and stereotypical, a caricature of a people. But "real" living Indians like Steve's Cherokee? Well, of course, they were colorful enough in their beads and feathers, stomping out a war dance at summer powwows. But then, everybody knew, they went back to their dreary reservations and drank themselves into an unjust but inevitable oblivion. The reality of who they might actually be, what they were actually like, seemed of little interest. Depressing at best. A matter for sociologists and anthropologists and ethnohistorians. Such knowledge is worse than mere ignorance. Ignorance at least has a certain purity to it. What you don't know you don't know. You are the proverbial tabula rasa, a blank slate. But the slate of my mind had been scribbled on with a thousand scrawls of misinformation concerning Indians. I had five hundred years of history to unlearn, and, I must admit, I am still unlearning. But of this I had little concept that day in 1981. What's more, I couldn't even imagine how appalling my ignorance was. "Well, it does have a certain ring to it," I admitted grudgingly to Steve. "But it sounds a little mystical for the magazine. I don't know. Maybe work up a proposal and send it to the planning council next month." Steve shrugged off my caution. "I think I'll bring Two Trees up right away to see Garrett!" Bill Garrett was then the editor of National Geographic. Something of a visionary himself, he'd taken the magazine in exciting new directions from its stodgily conservative origins and...who knows? I'd heard he occasionally spoke proudly about a Shawnee greatgrandmother. He might just take a flyer on such an alluring story. But, still, I was discouraging to Steve. How did he know this Two Trees fellow was for real? I didn't want any embarrassments in our objective magazine. I knew that many a fake and charlatan guard the entrances to the Native American otherworld. Was this guy authentic? A real medicine man? I could almost hear Steve grimacing over the phone. He heard me out. I'll never forget one thing he said: "Harvey, why is it Indians always have to be real or authentic? I've never heard anyone ask if a white man was real or authentic. Can you answer me that?" Needless to say, Steve brought Two Trees up to see Garrett. Harvey Arden, retired senior writer for National Geographic, produced some of the magazine's most memorable stories during his tenure. Several of his articles have been reprinted in Reader's Digest. Steve Wall, a documentary photographer, has worked in more than forty countries, primarily for National Geographic magazine and books. His work has been featured in the United States and international publications and exhibited in galleries, museums, and collections in more than eight countries, including The International Center of Photography in New York and the Gallery of the Union of Artists in Moscow, Russia.